Dhaka, 4 Mar, Abnews: President of Vietnam Tran Dai Quang arrived on a three-day state visit on Sunday amid a rousing reception, reports UNB. The Vietnamese president arrived in Bangladesh at the invitation of his Bangladesh counterpart Abdul Hamid with both the countries looking for a broader trade and investment ties. President Abdul Hamid along with his wife Rashida Khanom received Tran Dai Quang and his spouse as he arrived at Hazrat Shahjalal International Airport at 3:52pm on Sunday by a special flight, an official told UNB. The Bangladesh President escorted Quang to a makeshift dais as a joint contingent of army, navy and air force offered him a guard of honour. The national anthems of respective countries were also played as part of the ceremony. After the reception ceremony, the Vietnam President left the airport for the Pan Pacific Sonargaon Hotel where he will be staying during his visit, officials said. This is a high level visit of any Vietnamese leader in 14 years as former President Tran Duc Luong toured Bangladesh in 2004. Vietnam was among the first countries in the world to recognize Bangladesh's independence. 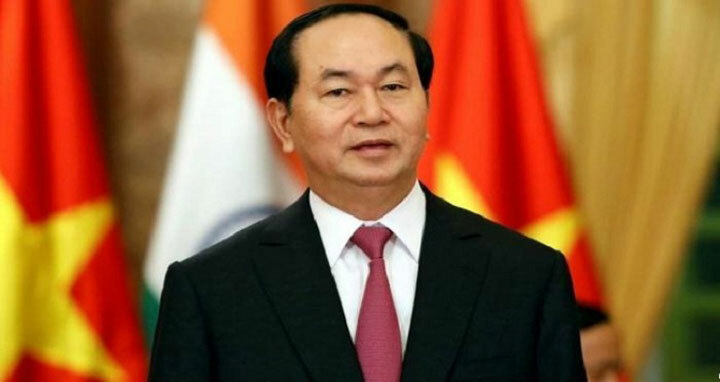 Quang's official engagement is scheduled to begin with the meeting of the foreign ministers at the place of residence in the evening, according to the programme schedule. The Vietnamese President will lay a wreath at the National Memorial in Savar tomorrow morning to pay homage to the 1971 Liberation War martyrs. He will plant a sapling and also sign the visitor's book there. Later, he will visit the Bangabandhu Memorial Museum at Dhanmondi at 9:35 am and lay a wreath at the portrait of Father of the Nation Bangabandhu Sheikh Mujibur Rahman to pay respect to the memory of the greatest Bengali of all times. The Vietnamese President is due to hold talks with Prime Minister Sheikh Hasina on different bilateral issues at the Prime Minister's Office at about 10 am on the day. Some memorandums of Understanding (MoUs) or agreements are expected to be signed there. Later, Quang will visit the Jatiya Sangsad complex where Speaker Dr Shirin Sharmin Chaudhury will meet him at about 3:40 pm. President Quang will hold a meeting with his Bangladesh counterpart Abdul Hamid at Credentials Hall of Bangabhaban at about 7:30 pm tomorrow. A state dinner followed by a cultural function will be held in honour of him. Wrapping up his official visit here, Vietnamese President is scheduled to leave Dhaka on Tuesday afternoon. Foreign Minister will see him off at the airport.